This tidbit definitely falls into the category of “This is obvious once someone tells you.” No one told me but necessity is the mother of invention and so I tell you in case you also have need. First, I have a high standard for tea in my household. If I am drinking a turmeric, ginger, sage, or other tea, I typically am really drinking an infusion. 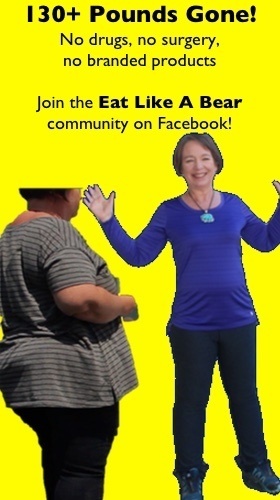 Many of the recipes on this site suggest that you let your medicinal-type teas “steep for at least 30 minutes or (better still) overnight.” I put a lot of herb in my water and let it steep overnight for a strong tea loaded with health-promoting properties. In the wintertime if you came into my kitchen you would very likely find one saucepan with an infusion of some kind. This past week I had four different pans dedicated to teas. That is a bit much but I do have a big kitchen, I like teas, and I had a need. But there was that one morning…. What I did have was fresh ginger in my refrigerator and I was preparing breakfast anyway. I quickly sliced up a root while the water boiled. I poured the boiling water over the root and let it steep as I finished my kitchen work. Within an hour I was in the car with rambunctious kids and rather than strain out that root and hit the road with less-than-worthy tea, I poured all of it into a stainless steel-lined thermos. I added elderberry syrup to it to sweeten it. That tea kept steeping as I drove around California’s central valley and I drank it throughout the day. That little moment of panic and lack of preparation then inspired another idea: Just before Christmas we headed to southern California and we all felt like we might have a slight beginning of sniffles. I packed a thermos with the actual ginger root inside of it and tossed elderberry syrup in our cooler. 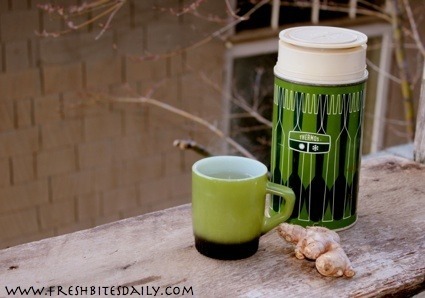 Not only did we have tea that day but I kept the ginger root and kept adding boiling water to the thermos. We visited my aunt and uncle, for instance, and boiled water at their place and added it directly to the thermos with the already-used ginger root. Obviously, each subsequent version of the tea gets a bit weaker, but it’s far better than no tea. 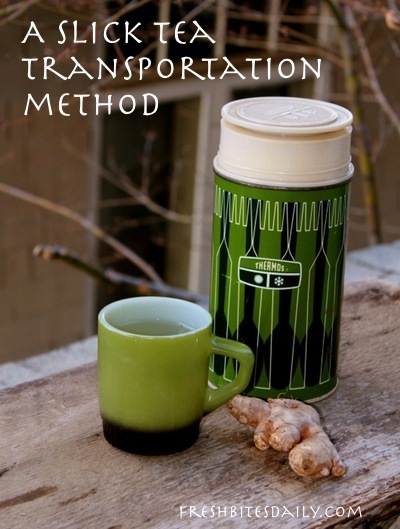 We added the elderberry syrup each time as well which made up for the weakening ginger. So, there you go. If you keep a stainless thermos anyway, you’re already set.